From Executive Producing feature films, to coaching CEOs and actors, Benjamin Mathes has now found himself "listening for free" all over the globe. We sat down recently with Ben to talk about his story and how he came to create a career and life rooted in service. Hey Ben! Very excited to chat with you. You have such an interesting perspective on creating a career that not only serves your own life, but also the lives of others. But before we dive into that, can you tell me a little bit about your background? I'm from Atlanta, Ga. I play Ultimate Frisbee. I write haikus. I have eaten the same sandwich everyday for almost 20 years. I pee'd in Times Square during the black out of 2003. I'm still rollin with Jesus. I went to a conservatory to study acting, but left early to be on a soap opera in NYC. I still cry when Forrest is standing over Jenny's grave. Asheville, NC is my favorite place to go in my mind. John Mayer's album "Heavier Things" reminds me of the time I lived in NYC. My heroes are my mom, dad, and brother. I love my past, I'm curious about my present, and I'm excited about my future. There are things I know about Ariel, my girlfriend, that always make me smile. The people in my life are the most creative, driven, and compassionate people I know. I'm usually crying on the inside because it's all so beautiful. I can quote most of "History of the World, Part 1" and the "Kings of Comedy". I prefer the mountains over the beach, unless I'm at the beach. Let's get coffee, not dinner. I know that you do many things in the entertainment industry, from executive producing to teaching to acting. Can you tell us a bit about how you've created such a diverse career? I do lots of things! I act, I teach acting, I produce films, I run a non-profit, I coach executives, I write... but, here's the thing: I'm really only doing one thing. For a while, I was trying to keep all these things going, and it's almost impossible to achieve any level of consistent greatness when you're spreading yourself across so many different things. Then, one day, I was sitting in the parking lot of a liquor store and I was at rock bottom. My personal life had taken a turn for the worse (my fault) and my professional life was scattered (coincidence?). I was on the phone with mentor of mine, and he challenged me to discover how each thing I did pertained to the other: You can't put 100% of yourself into 4 different things. Imagine a car. Each wheel is turning to make the car move. But, if you put 25% into one wheel, and 50% into another, and 12.5% in the other two, the car will just spins in circles. But, if you put 100% of your energy into the axel...all the wheels will turn. What's your axel? Spin the axel, and all the wheels will move. Am I doing 5 different things? I'm doing one thing that expresses itself in 5 different ways. The way I teach is the way I act is the way I coach is the way I write is the way I talk is the way I think is the way I love others. My axel: you matter, and I need you to believe that. 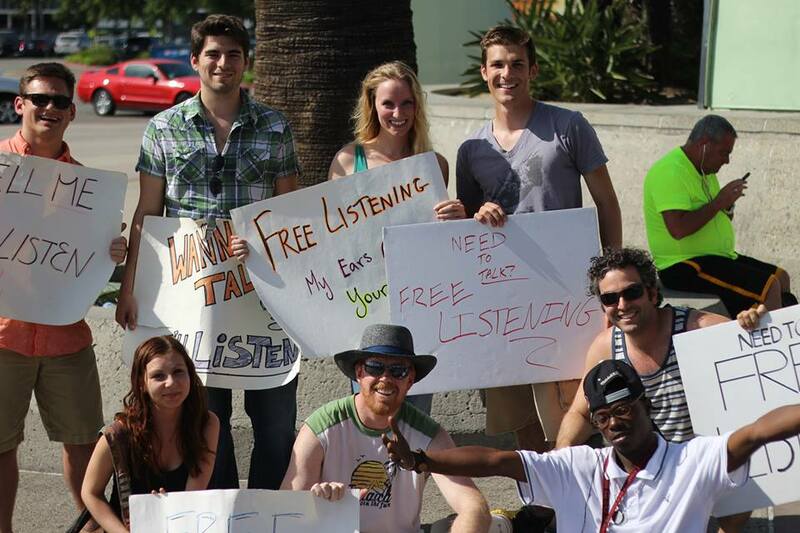 Free Listening is a non-judgmental, entirely open, and fully involved offering of listening to your community. It's about being present with another person, about getting interested in them, and allowing them to be exactly who they are in your presence. It's Free Listening, but really, it's Free With-ing! It's a two-way experience. For the speaker, it's a chance to be heard, to get things off their chest, or to tell the story of their life. 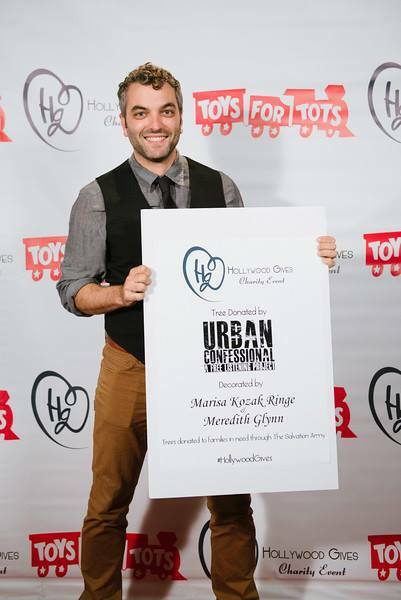 What inspired you to start Urban Confessional and "Free Listening"? About 5 years ago, I found myself in a place I never thought I'd be. I had become a man I never thought I'd become, and it sent me spiraling downward. Sometimes in the downward spiral, we can pause just long enough to look up and see things from a new perspective. It was close to Easter of 2012 (my favorite holiday), and I began to think about art. For me, Easter is significant in many ways, but perhaps the most powerful symbolic message of the holiday is life's triumph over death, beauty's victory over tragedy. It's a universal message embodied in the Christian holiday. This the role of the artist!--to turn tragedy into beauty, to take pain and express it. This is also the nature of service. So, I began to look for opportunities for the acting studio I run to incorporate service into their process. Anything that would flex the empathy muscle. I was crossing the street on my way to class in May of 2012 when a homeless man asked me for money. I didn't have any, but I offered to pray with him. So we did. I had never done that before... it was weird, but it felt good to hold an important space with him. It was deeply vulnerable. I realized that this is the exact level of connection and vulnerability actors are looking for on set or on stage. I didn't want to offer Free Prayer, I wanted something more accessible, something areligious. Free Listening seemed to be the closest thing that would create this experience. So, I went into my acting class and announced that I would be Free Listening the next day! It began with a group of actors, but has spread all over the world. Its simplicity. 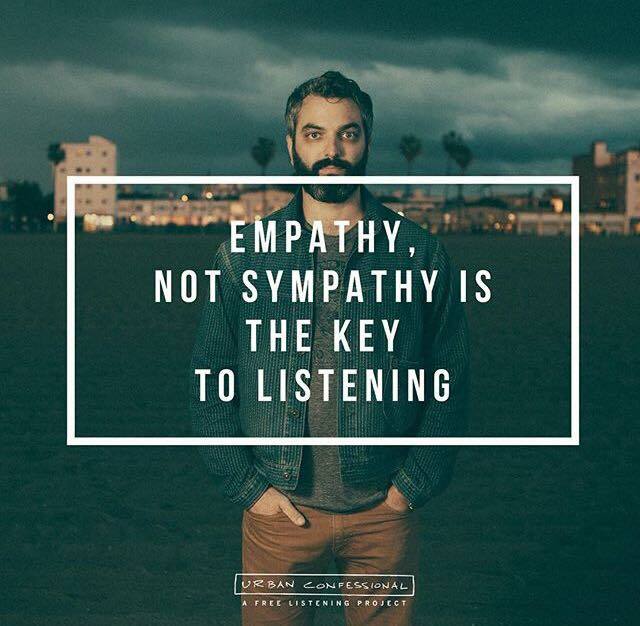 Listening is something you already know how to do. You don't have to be a trained professional. You are enough. There's no catch, no agenda, and there's room for everyone's story. You know, basic humanity stuff. Has this experience changed how you feel about your career going forward? It's reminded me that things matter more than money and ladders. It's taught me to find the "service oriented why" in all my career efforts, and to make that the single focus of any endeavor. It's taught me that failure is fertile ground for a harvest more abundant that I can possibly imagine. Were there any lessons learned or specific things about this experience that you think would help others in working towards their DreamJob? As a business person, I've learned that prioritizing the happiness of others over my own has made me more creative, more valuable to the market, and more complete as a person. It's the great paradox: of course, a Dreamjob must be profitable, but the best way to profit is to put people first. Serve others and everything else will follow. Do you have any advice for our readers on finding their ideal career or dream job? Ground your tolerance for risk in the assurance that success will triumph over failure, beauty over tragedy, and life over death; then, nothing can stop you. I'll be Free Listening at the Republican and the Democrat National Conventions in July. Could get wild! 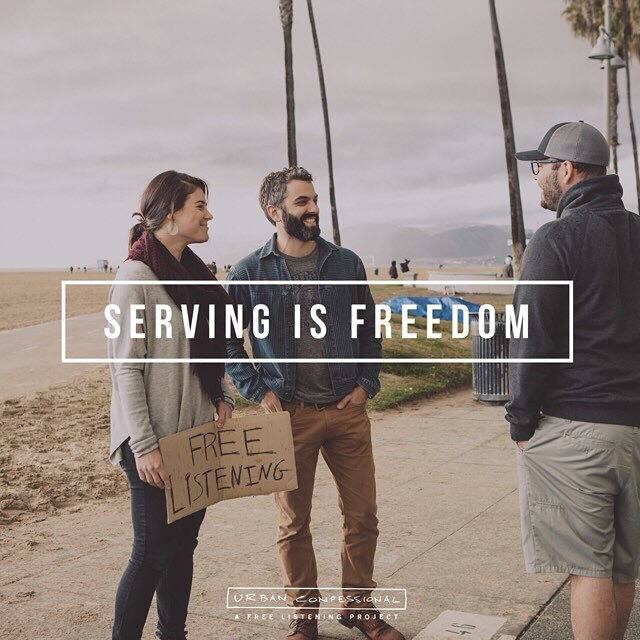 For more information on Free Listening and how you can get involved, check out the website, follow on instagam and twitter, and watch The Huffington Post's feature video on Ben and the Free Listening, Urban Confessional movement HERE.